The Honorable Minister Louis Farrakhan delivering keynote address during Saviours’ Day 2016. Imam Sultan Rahman Muhammad leads Jumu’ah prayer service. CHICAGO—Saviours’ Day, the annual Nation of Islam celebration and crowning event of Black History month, is coming back to the Windy City. Thousands of followers of the Honorable Elijah Muhammad under the leadership of Minister Louis Farrakhan, supporters, dignitaries, family and friends from around the world will convene Feb. 23-25 for a full weekend of interactive and informative workshops, plenary sessions and a variety of social events and activities for all ages at the McCormick Convention Center. Capping off the weekend will be the highly anticipated keynote address by Min. Farrakhan on Sunday, Feb. 25 at the new Wintrust Arena. His message will be broadcast live via internet at NOI.org starting at 2 p. m. CST. Saviours’ Day is the annual commemoration of the birth of the Great Mahdi and God in Person, Master Fard Muhammad, founder of the Nation of Islam and teacher of Elijah Muhammad. Master Fard Muhammad was born February 26, 1877 in Mecca, Saudi Arabia. “It’s a celebration of the Saviour, the founder of the Nation of Islam and our Master Teacher,” explained Ishmael R. Muhammad, Student National Assistant to Min. Farrakhan and son of the Hon. Elijah Muhammad. Detroit is where Master Fard Muhammad and the Hon. Elijah Muhammad first met in the early 1930s and where the first temple— as it was called then—of the Nation of Islam was established. Chicago was the second city and serves as headquarters of the Nation of Islam. “We’re happy to bring Saviours’ Day back to Chicago and we have enjoyed our annual Saviours’ Day Convention in Detroit for the last three years which is the second city or the twin city to Islam in North America. So coming back to Chicago we believe the Nation is very excited to come to Chicago,” said Min. Ishmael Muhammad. Saviours’ Day 2018 is also a divinely significant milestone in the ministry and mission of Min. Farrakhan in marking the completion of 40 years of teaching in the absence of his teacher, Elijah Muhammad. Scenes from previous Saviours’ Day celebrations. Shortly after the departure of Elijah Muhammad in February of 1975 the Nation of Islam fell and Mr. Muhammad’s name and transformative and redemptive work was rarely spoken of and discarded. The Nation’s mosques, schools, businesses and farmland were lost. In September of 1977, Min. Farrakhan, began the arduous task of rebuilding the work of his spiritual father. “We who are followers of the Honorable Elijah Muhammad see both the Hon. Elijah Muhammad and the Hon. Minister Louis Farrakhan as these men who are fulfilling prophecy and the extraordinary work that the Minister has done has never been done before,” said Min. Ishmael Muhammad. “There has never been a single person or student, disciple of any of the great ones that came before us that were maligned and attacked by the government of the United States of America through the Counterintelligence Program of the FBI and the operatives and agents that they sent to infiltrate Black organizations to disrupt these organizations and break them apart,” he continued. Coming out of the 1960s most if not all of the significant Black organizations that came to birth and were formed during that era were destroyed. “Coming into the ‘70s the Nation of Islam was the last major Black organization to have survived the onslaught of the United States of America’s wicked plans and after the Hon. Elijah Muhammad departed it appeared that the Nation of Islam also was lost,” said Min. Ishmael Muhammad. Student Minister Dr. Ava Muhammad is the Saviours’ Day workshop coordinator. She said participants can expect activities that incorporate the instructions and guidance laid out by Min. Farrakhan during two of his recent worldwide messages that closed out 2017, “Separation or Death,” in Newark and his warning to President Donald Trump, the U.S. government and Black people at a press conference from the Watergate Hotel in Washington, D.C.
“We’re no longer really concerned with trying to persuade people that the concept (separation) is acceptable after all of these years of being taught in the very best manner by the Honorable Minister Louis Farrakhan and being given a clear message coupled with the ability to look back in scripture,” said Dr. Ava Muhammad. “It’s a solutions- oriented convention,” she added. There will be workshops on Friday and Saturday featuring panelists and facilitators that are experts in various areas. “We have registered Muslims who have attained credentials, certification and experience in every field of endeavor. We have our own educators, doctors, lawyers, engineers, filmmakers, nutritionists and authors. We have a national imam fluent in Arabic, educated in the Middle East and of course the Nine Ministries which of course are those special fields of service to the community that have brought the Nation from that embryonic stage into one that is about to become a full-fledged human being ready to provide service,” explained Dr. Ava Muhammad. Min. Farrakhan desires that the workshops focus on training Black people in and out of the registered body of the Nation of Islam to be able to help develop their communities, she continued. Workshops will include a broad range of featured topics including: education, the Nation of Islam Student Association, young Muslim entrepreneurs, agriculture including urban farming and land acquisition, natural childbirth, drug and alcohol addiction, overcoming opposition, spiritual development, Dianetic Auditing, marriage and family life, the mission of the 10,000 Fearless and more. “It’s just a lot that we’re really looking forward to this Saviours’ Day,” said Dr. Ava Muhammad. The excitement and anticipation leading up to this year’s celebration is being felt and exhibited in the various Nation of Islam mosques and study groups around the country, said Min. Ishmael Muhammad. 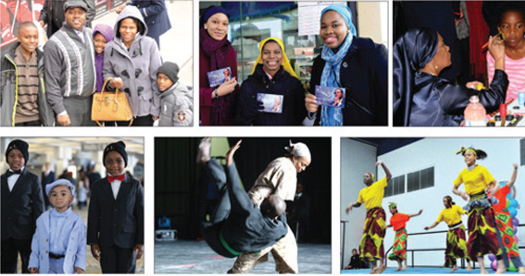 In Chicago, the Fruit of Islam from the Central Region have canvassed neighborhoods in the city, handing out flyers and spreading the word about Saviours’ Day. Social media is abuzz with flyers and information being shared about this major event. In addition to valuable workshops, other highlights during the weekend will include: Friday Muslim Congressional Prayer, a Drill Exhibition, a vendor’s marketplace featuring Black and Muslim-owned products and services, an F.O.I. and M.G.T. graduation for new members of the Nation of Islam, youth and adult evening entertainment and much more. Mother Khadijah Farrakhan’s Children’s Village will present the opportunity for youth of all ages to participate in fun and educational activities. “The Children’s Village is always a major highlight for Saviours’ Day and we’re very thankful to Mother Khadijah and the Minister for offering this each and every year that our children look forward to participating and attending Saviours’ Day as they will not only be able to enjoy children’s activities but they will also be taught and they will observe Salat-ul-Jumu’ah and valuable Islamic lessons and history of their Nation,” said Min. Ishmael Muhammad. 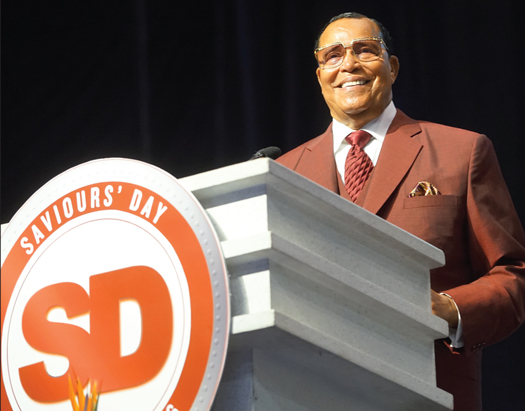 “We are looking forward to another great Saviours’ Day and that it will be an enjoyable, memorable experience for all who attend,” he concluded. For hotel, registration and ticket information, visit www.noi.org.